Live feeds of Suffolk Construction’s projects around the country appeared on screens behind CEO John Fish. 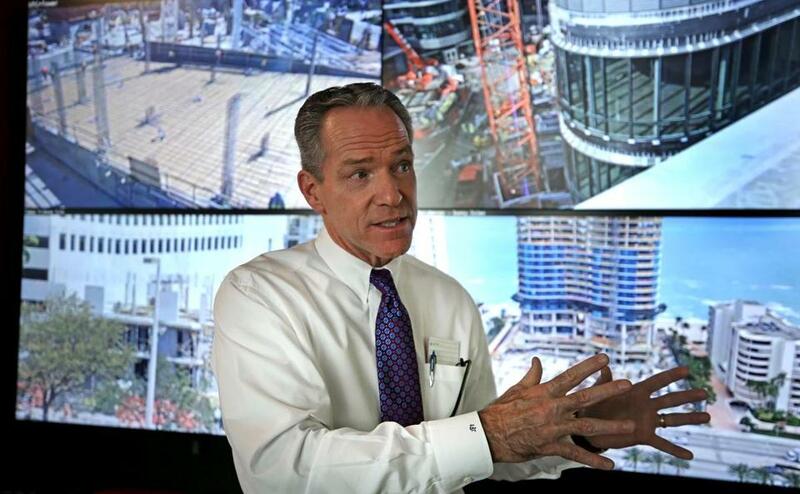 Viewing a giant screen at his Roxbury headquarters, John Fish can see a digital skyline consisting of projects his company is building around the country: 90 or so thin blue rectangles, lined up like a long row of thermometers taking the temperature of his far-flung construction empire. The newly opened Smart Lab is the cornerstone of a $60 million renovation underway at Suffolk Construction’s headquarters, a block off Massachusetts Avenue in Roxbury. This high-tech nerve center gives Fish and his executives updates and financial data on key construction sites, from an apartment development in Los Angeles to a rail terminal in Miami to the Wynn casino rising near the Mystic River in Everett. In addition to the “Datawall,” the lab has live camera feeds from various job sites and a room called the “Cave,” where people can use virtual reality to step inside three-dimensional models of Suffolk’s projects. plex and sometimes chaotic science of putting up big buildings, often in tight quarters. As part of the broader renovation project, most of the Suffolk complex is being transformed to give it a more open, modern feel — glass and concrete are replacing mahogany. A 38,000-square-foot addition opened late last year. The Smart Lab and related improvements reflect Fish’s ambitions to remake the company into a high-tech operation while fostering better connectivity among Suffolk’s 2,010 employees, about half of whom work in Boston. Suffolk has built similar “labs” at offices in San Francisco, New York, Miami, and Tampa, with two more expected to open within the next several months, in Dallas and Los Angeles. Suffolk has risen through the ranks to become Boston’s biggest construction contractor, with nearly $3.5 billion in annual revenue. Fish sees technology and data as the keys to keeping Suffolk in the top spot, enabling it to tackle challenging jobs such as the Wynn casino or the 742-foot-tall One Dalton skyscraper under construction in the Back Bay. The labs also serve as central gathering points for data streaming in from the job sites — information that Suffolk crunches regularly. The information from the Datawall skyline, for example, can be crucial in providing an accurate estimate for prospective jobs. The blue bars vary in height, based on the cost of each project. Orange rectangles rise within each bar, tracking construction progress, going higher on a regular basis. Touch one of the bars and a new dashboard appears, showing all sorts of information on each project. “It’s a way of looking at the entire operation that we haven’t done before,” Fish said. The job of harnessing all of this data falls to Jit Kee Chin, a former McKinsey & Co. consultant with a doctorate in physics from the Massachusetts Institute of Technology who was hired last year to help with his technology push. David Manfredi, a founding principal at Elkus Manfredi Architects, said the data can uncover construction problems and more accurately anticipate schedules and material orders for a job site, minimizing wasted time and money. Manfredi’s firm regularly teams up with Suffolk on projects and designed the renovation of its headquarters.